The starlet sea anemone changes its venom throughout its life cycle. Credit: Michael J. Layden, Fabian Rentzsch and Eric Rottinger. The starlet sea anemone, found in shallow, brackish water along the East and West Coasts, is a relative of the jellyfish that can grow up to a little more than 2 inches long. 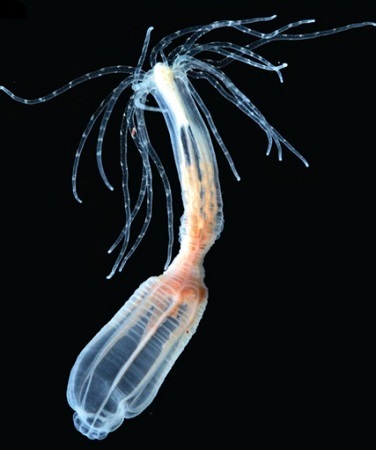 A group of scientists studied this sea anemone, scientifically named Nematostella vectensis, throughout its life cycle to learn more about the venom it produces. The anemone starts out as a tiny oval larva, an attractive meal for predators passing by. But when a predator swallows the larva, it spits it back out because the larva’s powerful venom—passed along to it from its mother—is poisonous. Then, as the larva metamorphoses into an adult, the composition of its venom changes too. The adult starlet sea anemone is a predator that stings small fish and shrimp to feed on them. But even adults do not rely on producing just one type of toxin. The venom’s recipe shifts according to the anemone’s environment, diet and needs. Past research has found that cone snails and scorpions use one type of venom for defense and another for catching prey. The new findings from the starlet sea anemone suggest that other animals might also have different toxin concoctions—and that could mean new opportunities for researchers to develop new medicines.